Stained concrete delivers a broad range of decorative designs to both the interior and exterior spaces. You can use this technique in both your residential and commercial properties. The appearance of these floors closely resembles that of natural stone and they come with a high gloss finish that is highly attractive. It is one of the best choices that you can make if you want to add value to your space. Stained concrete comes in a broad range of color options and you will not fail to get one that blends well with the design of the entire building. It also has several design possibilities and hence you can link it to your personal tastes and preferences. Experienced remodeling contractors will tell you that you have to apply decorative stains after curing the concrete. It is also possible to apply stains on old concrete. However, you have to complete any repairs and clean the surface thoroughly before you make the application. The stain mix will depend on your color choice and intensity. Both the client and the project manager have to work for hand on hand to determine the best shade for the stains. There is a chemical reaction that results in the coloring and professionals will always give it enough time to complete. You can then wash the floor and allow it to dry. Apply a protective resin on the top of the surface to give the polished concrete floors a glossy appearance. We have so many designers who are turning to the available stained concrete products. 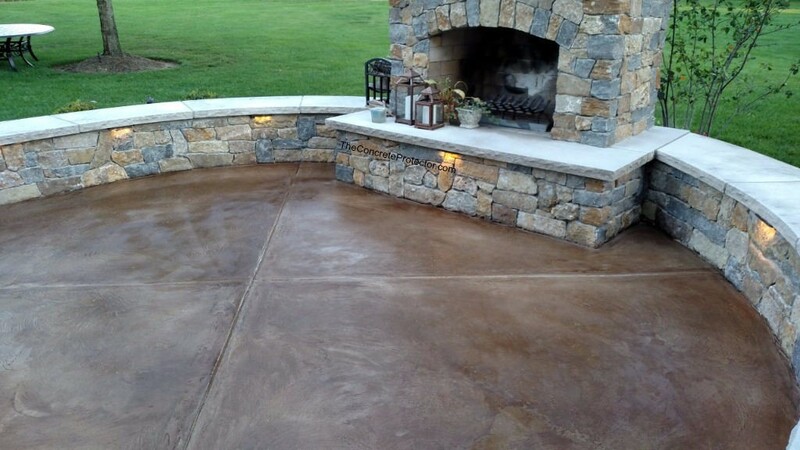 The best decorative concrete staining system will give you a broad range of colors and looks. Some products are fully dedicated to the interior spaces while others can serve the exteriors quite well. Its good to seek for professional guidance when choosing the right stained concrete products to apply on your surface. Experienced contractors know what works well and what does not. It’s good to get stained concrete surfaces that are going to last you long enough. Stained concrete has a decorative and stylish look. It does not matter whether you are applying it indoors or outdoors. The finished look is non-slip and also glossy making it very appropriate for shops that are around the home. It can either be flat or textured depending on your taste and preferences. It comes in various patterns and colorings. The truth of the matter is that decorative stained concrete will make your office, shop, or home to stand out from the rest. Its one of the best approaches if you want to give your space an elegant appearance. You can be sure of receiving several questions and compliments about the stunning appearance of your new space. It’s the best approach if you want to add true value to your space. Concrete floors are among the low maintenance alternatives that are available in the market. It is very easy to clean workplaces and homes that have stained concrete surfaces. These materials eradicate the requirement to use harsh cleaners and chemicals on the surface. Stained concrete spaces are livable and warm even though we have a few individuals who think otherwise. All you need in mild soap and warm water and you will be ready to clean your concrete surfaces. You can also consider going for stained concrete surfaces for the exterior of your home if you want to give it a stylish look without spending a lot of money. The application of decorative stained concrete on your pathways, drives, workshops, entertaining area and garages will give them a fantastic appearance. It comes with a high gloss finish that gives the design a more appealing look than what the alternative flooring has to offer. It also works so well around wet areas because of the non-slip surfaces. Like the case of polished concrete floors on the interiors, there is a broad range of color options that come with stained concrete. Therefore, you will not fail to get something that seamlessly blends with the interior of your home. Get a highly qualified professional like http://www.customconcreteorlando.com to work on your stained concrete and you will surely be impressed with the end product.